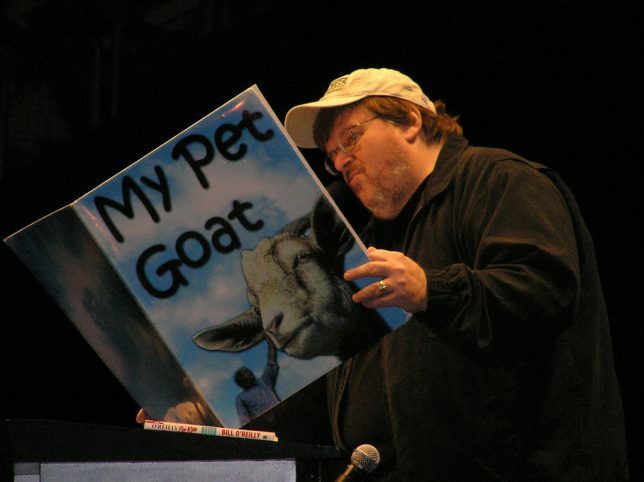 Michael Moore reads his favorite book. The manufactured mass hysteria continues. It feeds on itself. It infects. It multiplies. It smothers. It threatens to snuff out American democracy itself. After National Security Advisor Mike Flynn, an arch foe of Islamofascism, was forced out of his post by an East German-style Ben Rhodes-centered deep state cabal, Marxist provocateur and agitprop movie director Michael Moore is demanding that President Trump be arrested. More on Moore’s psychotic break on social media in a moment but first let’s look at the details that are emerging of a real-life plot against the nation’s 45th president. Flynn, a retired U.S. Army Lieutenant General, fell on his sword Monday night reportedly for improper proximity to Russians. The White House claims Flynn resigned after admitting he lied to Vice President Mike Pence about his conversations with the Russian ambassador to the U.S.
It’s not like we know what actually happened with Flynn and the alleged Russian intelligence operatives at this point, or if there was any contact at all. News reports don’t quote any on-the-record sources. It is conjecture piled on supposition heaped on speculation to the power of 10. 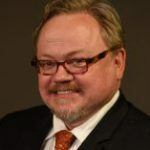 Despite the ravings of Moore, NBC, ABC, CBS, CNN, the New York Times, the Washington Post, Bill Kristol, David Frum, and many others, there is no credible evidence that Trump had anything to do with the hacking of the Hillary Clinton campaign and the Democratic National Committee or that Trump colluded with Russia in whatever may or may not have happened. All of it could be (and likely is) completely made up. Fiction is, after all, what Ben Rhodes specialized in when he worked in the Obama White House. Rhodes bragged about duping Americans by creating a media “echo chamber” to promote the botched, unenforceable nuclear nonproliferation agreement with the Islamic Republic of Iran that will actually end up helping the mad mullahs who want to kill us all get the bomb. Rhodes became a misinformation-manufacturing servant of a hostile power while betraying his fellow Americans to help an Islam-loving president cozy up to the world’s worst state sponsor of terrorism. And the media has lied over and over and over again about President Trump, especially concerning Russia. The false media narrative about then-candidate Trump’s raging case of Russophilia got a huge boost last summer when NBC reporter Katy Tur shouted a loaded question at Trump to introduce into the mainstream media ecosystem the Big Lie that Trump had personally invited Russia to interfere in U.S. elections. Trump was understandably dismissive of Tur’s question without specifically denying the premise underlying it — which was the false assertion that Trump asked a foreign government to engage in hacking. And so Tur’s strategically inserted Big Lie was carved into the Left’s narrative and repeated so many times that the mainstream media now treats it as incontrovertible fact. The Trump as pro-hacking myth is an example of the power of propaganda to alter the course of events. This kind of malevolent story-telling is what the Left and the mainstream media do every day. There is a good reason why the NSA’s ability to share data was limited, Walsh notes. And the genius of the Democrats — something for the GOP to think about next time — is that they were able to leverage the transition in order to change as many rules and embed as many apparatchiks as possible before formally turning over the reins to the new kids. Another way of putting it is Obama seems to have cleared the way for his confederates to do their dirty work to undermine the incoming Trump administration. Think about that. It’s very Stasi. Erich Honecker would be proud. In a separate article at PJMedia, Walsh made the case that “a rolling coup attempt” is in progress. Former CIA analyst and retired U.S. Army Reserve Lieutenant Colonel Tony Shaffer says the Obama administration was “directly involved” in the Flynn saga. He said the blame lay “squarely at the feet of” former CIA director (and suspected Muslim) John Brennan, former director of National Intelligence Jim Clapper, and Ben Rhodes. He's only first to go. One by one they will drop until the so-called president is told "you're fired." Up next, Miller & Bannon. Miller refers to Stephen Miller, Special Advisor to President Trump. Bannon is Stephen K. Bannon, Senior Counsel to President Trump. He wants Flynn arrested, too. Fondly remembering traitor Michael Flynn at the Republican convention leading the cheer from the stage: "LOCK HER UP." Bring on the thorazine and straitjacket. A conspiracy theory from a fevered mind is fleshed out a bit. He cites the Left’s favorite purveyors of false information who still haven’t managed to cough up intelligence community sources willing to go on the record. He gets creative. Moore is an artist, after all. Next he cites a thinly-sourced, no, make that an un-sourced, article in the New York Times. The newspaper claims “four current and former American officials,” left unidentified, told its reporters that Flynn did vewy vewy naughty things. Just a reminder that the guy who appointed Flynn also wants to appoint a SCOTUS justice who will serve for the rest of their life. On Facebook he lays out a road map for ousting Trump. 1. I and tens of millions of Americans demand that the weak and spineless Democrats bring Congress to a halt until investigative hearings are held and impeachment charges are filed. We don’t want to hear you Dems huff and puff and grandstand and take symbolic actions. We demand that you halt all actions being taken by an illegitimately elected government until this matter is resolved. 4. Somehow, our judicial system has to find a way to make restitution to this country. Pence can’t be president as he, too, was elected under this same fraud. The court has to rule either that the President is the winner of the popular vote OR the election must be held over. The Republicans– the beneficiaries of this treason –cannot be allowed to hold on to the power by default. If it turns out there’s a traitor in the White House, the judicial branch must find a fair, peaceful way to un-do and then re-do the election of 2016. Moore then removes all doubt he’s a rocket scientist. It doesn't take a rocket scientist to figure out what was going on: TRUMP COLLUDING WITH THE RUSSIANS TO THROW THE ELECTION TO HIM. He repeats his Facebook demand. We demand that the weak & spineless Democrats bring Congress 2 a halt until investigative hearings are held & impeachment charges are filed. And then he moves on to something else. Maybe he saw a Kentucky Fried Chicken commercial on TV. It is important to note that Moore doesn’t talk about the arguably treasonous behavior of Barack Obama and Hillary Clinton. There was President Obama’s infamous hot mic moment in Seoul in March 2012. At a summit, Obama leaned over to then-Russian President Dmitri Medvedev and asked him for more time “particularly with missile defense” — until he could safely win reelection later that year. “I understand your message about space,” replied Medvedev, who at that time was scheduled to cede the presidency to Vladimir Putin two months later. “This is my last election … After my election I have more flexibility,” said Obama. “I will transmit this information to Vladimir,” said Medvedev. Moore doesn’t complain about then-Secretary of State Hillary Clinton approving the sale of 20 percent of U.S. uranium to Russian interests, either. That’s because these facts don’t follow the Left’s Trump-is-Hitler narrative. Moore doesn’t care. Propagandists don’t have to.